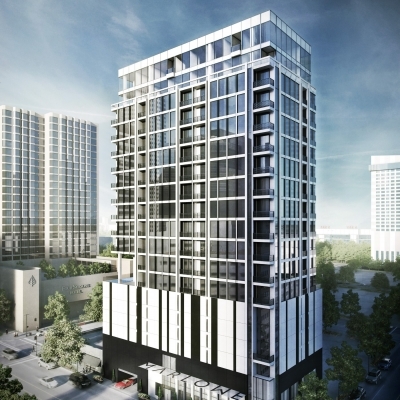 Rendering of Marlowe condominium project under construction in downtown Houston by Randall Davis. HOUSTON – (By Michelle Leigh Smith, Realty News Report) – Easy upkeep. Great views. And you’ll never have to worry about flooding. More homebuyers are asking: What’s not to like about condominiums? And if the condo is in a new tower, so much the better. The condo-craze is a statewide phenomenon. 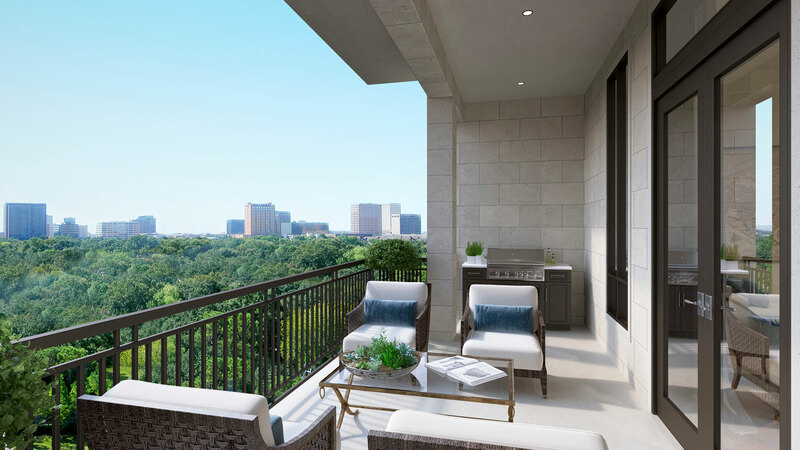 Large balcony promotes outdoor living at The Revere condominium building in Houston. One new project creating buzz is The Wilshire, inside the Loop at 2047 Westcreek Lane between Westheimer and San Felipe. Two years since breaking ground in the summer of 2015, Pelican Builders welcomed the residents moving into their new luxury digs at The Wilshire – the next-generation, 17-story tower. Just as the adjacent River Oaks District continues to fill up its Italian stone-clad walls with new luxury brands and white-hot restaurants, The Wilshire has steadily marched toward completion with brisk sales since being announced during the recent oil downturn. “With just 14 of the 96 residences remaining on the market, the building is expected to be 100 percent sold by the end of the year,” says Robert Bland, principal with Pelican Builders. The Wilshire offers 14 floor plans ranging from 2 bedroom / 2 bath averaging 1,300 square feet to 3 bedroom / 3 1⁄2 bath penthouses averaging 3,500 square feet. All 96 residences boast balconies with primary views facing west or downtown views facing east. The bulk of Wilshire residences still on the market are priced around $800,000. “The response to The Revere has been so positive that we are committed to breaking ground in Spring 2018,” says Bland. 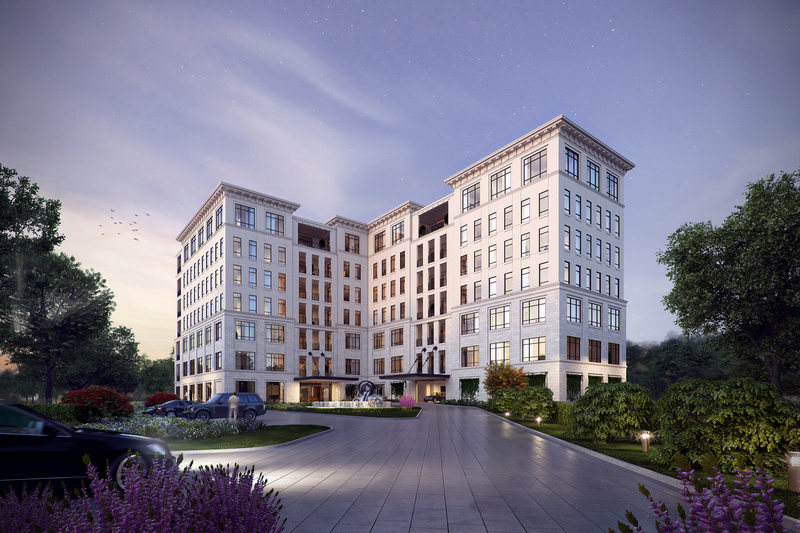 “It’s truly a milestone event for Pelican Builders and confirms that there is a market for people looking for a hassle-free, luxury lifestyle in a River Oaks location – now more than ever.” Pelican Builders plans to build the nine-story condominium project near River Oaks in Houston. The Revere will have residences ranging in size from 2,677 to 3,867 SF and priced between $1.6 and $2.9 million and 30 percent of them are already sold. The building — “designed with River Oaks empty nesters in mind” – is located just east of Kirby Drive and south of San Felipe, at the southeast corner of Revere and Welch Streets, Bland said. In the Museum District, Museum Boulevard Condominiums recently obtained construction financing, according to Transwestern’s Structured Finance Group. Surge Homes is the developer of the 49-unit Museum Boulevard project, located at 4819 Caroline Street, just north of Hermann Park and the Texas Medical Center. Surge Homes priced the condos from $140,000s to the $340,000s. Surge announced the project offers lofts, one-and two-bedroom homes, and penthouses ranging from 420 SF to 1,099 SF. Houston-based Surge Homes is led by Louis Conrad and Ben Lemieux. The Sophie at Bayou Bend is under development by Stolz Partners of Atlanta. Stolz Partners of Atlanta is developing The Sophie at Bayou Bend, a seven-story, 42-unit condominium project on Memorial Drive near Memorial Park in Houston. Designed by Mirador Group and marketed by Sudhoff Cos., the Sophie project has registered significant pre-sales with an average price of $1.8 million. IBC Bank is providing construction financing. “The Sophie at Bayou Bend’s early success is proof that Houston’s real estate market is continuing to thrive,” says IBC Bank-Houston CEO Jay Rogers. Stolz is also developing the Giorgetti mid-rise condo at 2710 Steel, near Kirby Drive and Westheimer. Each of the 32 units will have the option of being fully furnished by the designer, Giogetti Atelier of Milan. Kristina Houston, a local real estate agent, says they will start at $1.4 million. Multifamily developer Randall Davis is building two new condo towers. The Arabella with units priced from $1 million to $8 million at 4521 San Felipe near Loop 610 and The Marlowe in downtown. The Mondrian at the Museum – developed by the Oxberry Group and designed by Perkins +Will with interiors by MaRS/Mayfield and Ragni Studios – offers 20 units, on eight floors at 5104 Caroline. Units there start at $1.3 million for 2800 SF and go to $1.7 million for a three-bedroom, 3200 SF unit. There are two penthouses, priced beginning at $2.9 million. Sales director Nicole Calderon says they are 55 percent sold. And there’s The River Oaks, at 3433 Westheimer. It’s a 17-story tower, originally built in the 1960s that was recently stripped down to its structural skeleton and redeveloped into 80 upscale units by Arel Capital of New York. Interior designer Lauren Rottet assisted with the transformation. 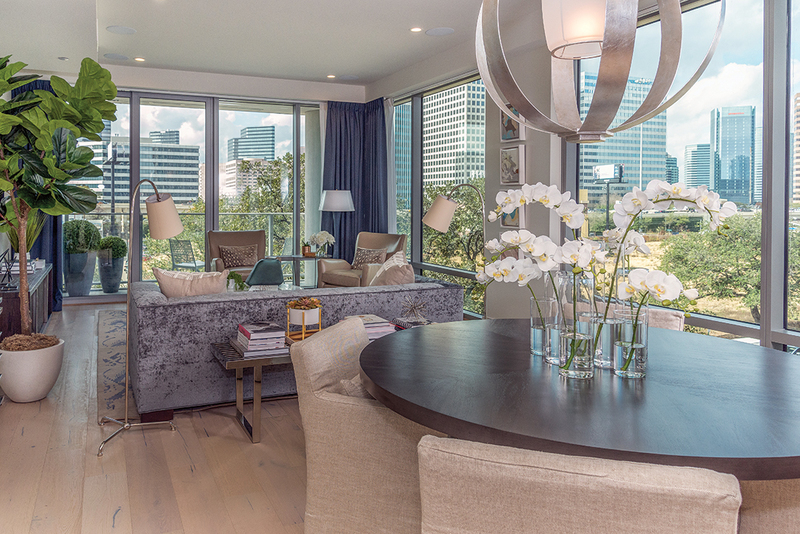 The River Oaks, offers units beginning at $1.6 million up to $6.9 milllon. Only nine remain for sale. While the market for newly-built condos are impressive, if sales of existing units are included along with townhomes in the stats, the Houston Association of Realtors reports sales were flat for much of 2017 – until Hurricane Harvey left town. “Townhome/condo sales are at the same level as 2016,” says David Mendel, Public Relations Manager for the Houston Association of Realtors. “In our latest report, 6,120 units have sold year-to-date, the same as last year at this time.” HAR’s figures are from January 1 through November 30 – identical to YTD 2016. The YTD average sales price is $203,624 (up 2 percent ) and the YTD median sales price is $160,000 (up 2 percent). According to HAR, the townhome and condominium market began its post-Harvey rebound in October with a monthly total of 543 units sold, marking a year-over-year increase of 5.8 percent. Inventory stands at a 3.9 months supply, down from its pre-Harvey peak of 4.5 months. The future trends point upward and outward – even to the suburbs. The Wilshire, Pelican Builders’a new 17-story condo in Houston, was designed by the Kirksey firm. For the interiors, Pelican added a special triple play display. The Wilshire has three unique designer models designed by BeDesign, Mark Williams Design Associates and Tipler Design Group. BeDesign created this model home in The Wilshire. BeDesign executed their model with the help of the iconic Italian brand, Zanotta. Working remotely from Italy, the Zanotta team worked closely with BeDesign’s Adrian Duenas and Marcello Saenz to pick a Wilshire residence with views of trees and nature that ultimately inspired their green color palate. The green no doubt incorporates a warmth to their very modern, cleanly designed space. It’s no surprise that the model emanates a European vibe as the entire unit is outfitted by European brands. The piece de resistance is the Molten&C custom closet made in Italy that will have even the most discerning clothes horse drooling over the amazing features and functionality. While the design might be considered minimal it is anything but with the Zanotta furniture, Kartell lamps and accessories, Demo and Vibia lighting, Nanimarquina rugs, Glas Italy console and over $500,000 of specially curated art from Houston’s Art of the World gallery. MWDA designed a living room with a view. Mark Williams Design Associates (MWDA) would categorize their style for The Wilshire as Tailored Sophistication. They strived to create a space that felt inviting and timeless to match the buildings elegance and warmth. 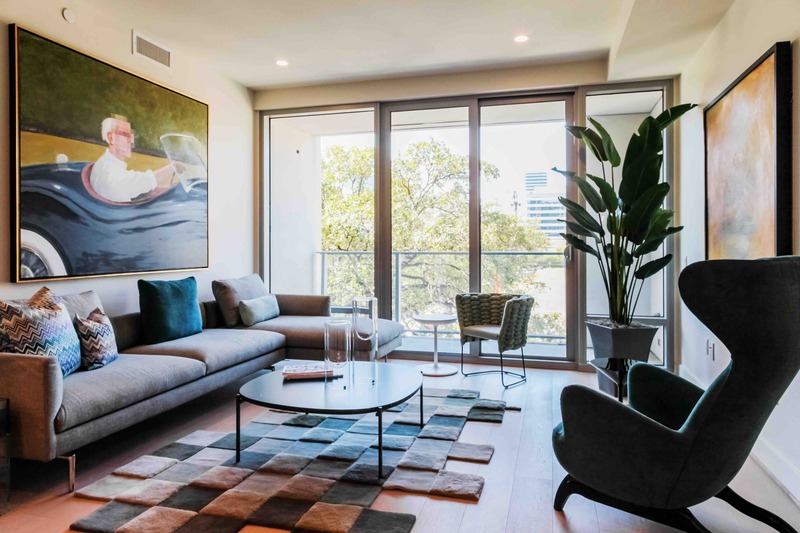 From the most traditional to the ultra-contemporary, The Wilshire’s ample floorplans and beautiful palettes made it easy for the Mark Williams design team to create a space that could appeal to a variety of buyers. The Wilshire is destined to become an iconic residence and MWDA did not want anything in their model interior to feel trendy, so they opted for a neutral palette balancing warm and cool tones. MWDA was fortunate to work with some of their favorite major market retailers, several of whom are neighbors of The Wilshire. Mitchell Gold+Bob Williams, Restoration Hardware, Janus et Cie, as well as some custom lighting through Circa Lighting. They wanted to make sure they were conveying the opportunity for various furniture arrangements based on any individual’s needs. The Tipler Design Group was guided by the light. From an aesthetic perspective their goal was to highlight the amazing light in the bedrooms and living spaces and deliver a modern, but comfortable environment with unique touches added by original artwork. The main furnishing pieces in the dining room and living room were selected in neutral colors of white, black and gray. They used the showpiece rug, designed by Suzanne Sharp and manufactured by the Rug Company in the living room, featuring a contemporary take on the classical Greek Key pattern, in hues of black, beige and emerald green as the launch pad for accenting the luxury condo.